This year was the third time that I participated in the glia conference in Edinburgh. As always, it was a meaningful event for me and it gave me the opportunity to learn new things and meet interesting people. Until last year, I worked mainly on Multiple Sclerosis and hippocampal neurogenesis in the Neurology Department of the University Clinics Düsseldorf. Therefore, presenting these topics on conferences was easy, as everyone usually had a solid background in the biology of the central nervous system (CNS) and many people worked on neurodegenerative diseases. This time, however, was different: I arrived there with a completely new topic from a more specific scientific field. My project, called “enteric glia cells and their function in the enteric nervous system”, elicited many questions as many people don´t know much about the enteric nervous system, especially about the glia population there. Accordingly, many people reacted somehow curious and asked numerous basic questions about my project. I felt a bit like an “alien” on the glia meeting. It seemed to me that enteric glia cells have not been fully recognized even in the glia community so far. Therefore, I would like to use this article to present some interesting facts about the enteric nervous system and especially enteric glia cells, a rather unknown cell type that deserves more attention. Everyone is aware of the central nervous system with its essential functions and occurring diseases complicating the life of many people. The CNS consists of divers various neuron and glia sets with the glia population subdivided in astrocytes, oligodendrocytes and microglia. They all have their specific tasks to give the organism the possibility to feel and think. The less prominent enteric nervous system (ENS) has a similar cell structure with an even comparable diversity in the neuronal population in the gut and a very distinct type of glia cell supporting all these neurons. Technically, the ENS is our “second brain” having sheaths of neurons embedded in the walls of the long tube of our gut, known as the alimentary canal. So, the ENS is the largest and most complex division of the peripheral and autonomic nervous systems and it has a complex mixture of neurotransmitters and neuromodulators similar to those found in the CNS. The network of neurons and glial cells, which are grouped into ganglia, are located in two major plexuses: the myenteric (Auerbach’s) plexus and the submucosal (Meissner’s) plexus (Figure 1A and 1B). The digestion itself is complicated machinery, so it is necessary to have a devoted network of neurons in charge to regulate all simultaneous processes. Furthermore, the ENS monitors the mechanical mixing of food in the stomach and synchronizes muscle contractions to transport chymus through the gut. Even more essential, the ENS also preserves the biochemical environment within different segments of the gut, maintaining them at the correct pH and chemical composition needed for the digestive enzymes to fulfill their purpose (1,2). Overall, the ENS operates this unique digestion machinery every day in our life with great precision and keeps us healthy. Embedded in the gut wall, the ENS has long been known to control digestion, but a simpler reason why the ENS is so essential is that every meal is a potential health risk. Similar to the skin, the gut must protect the body from possible harmful intruders, such as viruses and bacteria. In case pathogens cross the gut border, resident immune cells of the gut wall secret inflammatory substances, which activate the neuronal network. Then, these enteric neurons either directly trigger diarrhea to flush out pathogens or alert the CNS, which can initiate vomiting. Interestingly, the ENS also plays a vital role in our physical and mental well-being: Even if we are not always aware of our gut “feeling”, the ENS helps us to sense environmental dangers, and to solve them in an efficient manner. Current research is focused on how the “gut brain” regulates the body’s immune response; after all, around 70 percent of our immune system is aimed at the gut to flush out and kill pathogenic trespassers (3). More and more evidence indicates that the development and function of ENS is controlled by microbial factors and the immune system. Apart from the importance of the ENS for gastrointestinal homeostasis, the ENS also serves as a relay station along the gut-brain axis that converts information from the luminal microbiota to the CNS. The mechanisms defining the gut-brain axis communication include the immune and endocrine system, neural signaling through the vagus nerve and the microbiota-dependent regulation of the CNS. For instance, small molecules produced by microbiota are able to stabilize the blood-brain barrier by inducing tight junction proteins and control the maturation and activation of microglia. (A+B) The organization of the enteric nervous system (ENS). The ENS has ganglionated plexuses, the myenteric plexus between the longitudinal and circular layers of the external musculature and the submucosal plexus that has outer and inner components. Nerve fiber bundles connect the ganglia and also form plexuses that innervate the longitudinal muscle, circular muscle, muscularis mucosae, intrinsic arteries and the mucosa. Modified from Furness,The Enteric Nervous System (Blackwell, Oxford, 2006) (A); and Rao and Gershon, The bowel and beyond: the enteric nervous system in neurological disorders (Nat. Rev. Gastroenterol. Hepatol., 2016) (B). What part do Enteric Glia Cells play? Enteric glia cells (EGCs) are a fascinating cell type within the gastrointestinal cell populations that are perfectly located to participate in varied facets of gastrointestinal structure. Realizing that these cells, formerly only known for their mechanical support function, are actively modulating physiological gut processes, is opening a completely new vision with EGCs as key players in an already very complicated regulatory system (Figure 2). EGCs are associated within the mucosa to participate in gut barrier function by affecting epithelial cells, whereas the glia cells placed in enteric ganglia are actively involved in transmission processes at enteric synapses. Moreover, glia cells have a role in neuronal survival and neurogenesis during early development and after acute damage. The close relationship between enteric nerves and EGCs provides the basis for neuroglia cross talk causing the maintenance and survival of intrinsic reflex circuitries controlling motor, secretory, and absorptive patterns of the gastrointestinal tract. Conclusively, even still at the beginning, many cases involving EGC and neuronal abnormalities have been documented in functional and inflammatory diseases. 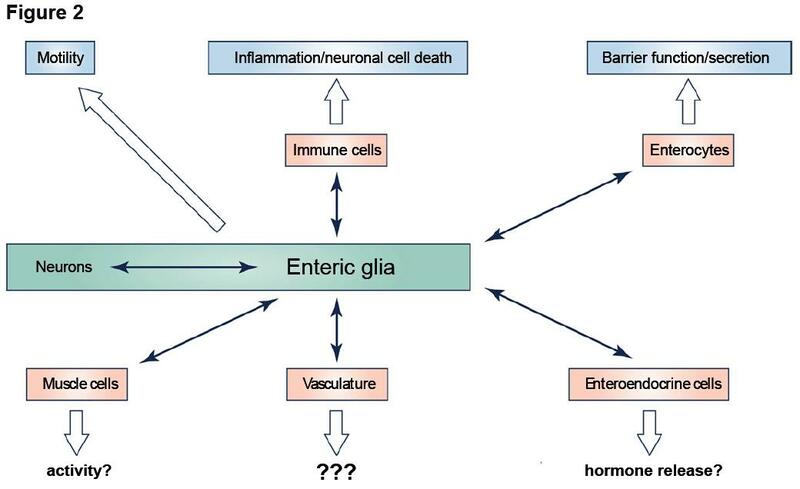 Overview of the various enteric glia functions. Modified from Grubisic and Gulbransen, Enteric glia: the most alimentary of all glia (J Physiol, 2016). In the end, the developing field of neurogastroenterology will hopefully offer some additional insight into the mechanisms of the “gut brain” and its impact on the body and mind. Till today, nobody has methodically examined the ENS regarding inflammatory lesions in context to disease states as it was done for the CNS. Hopefully, by working together and using all available resources, scientific research can establish a solid understanding of the enteric role in many different diseases.